My oldest daughter Alison visited a friend in California last weekend. She knows that Dave and I love lighthouses, so she took this beautiful picture and sent it to me today. 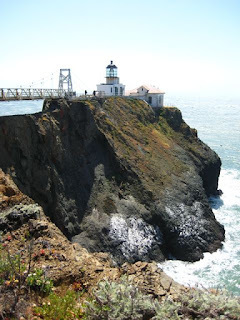 Now I have the urge to go visiting lighthouses again! I'm not much of a photographer, so I think I'll stick to tatting. I love this little motif... another design from Tatting by Myra Piper! I'm still emptying shuttles of Lizbeth thread (#634 and #682), and I'm really glad I tatted this design in two colors. I wasn't impressed by the little black and white photo, but I think using two colors really shows off the design. This is motif No. 13. ...or so they say! In this case, I think it's true! I really liked the red bookworm, but the multi-colored thread seemed lost. I think putting the solid on the inside and the multi-colored on the outside makes him so much more interesting! Hmmm... I just noticed a googly eye... another detail to watch for! 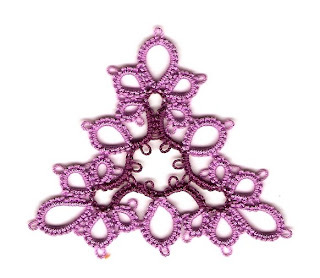 This is #10 from Tatting by Myra Piper. Despite the color combination, I love this little motif! I am very pleased with the way this little doily turned out. It's about 5 1/2" across. The threads are Lizbeth Country Grape dk. #682, Violet/Pink Med. #634, and Leaf Green Lt. #683. I did consider more rounds, but I think that the center motif would be completely lost if I added any more to it. I wanted the look of a bouquet of flowers with greenery, and I think that's what I have. I did make two additions to the pattern indicating how and where to join the last pattern repeat. The changes are in italics. If you decide to try this, would you let me know? I'd love to see your interpretation! I'd also like to know if the pattern can be followed by someone other than me! I think this is the perfect way to complete the 25 Motif Challenge! I can't believe I've finished the second edging repeat already! I am pleased to announce that the directions made sense to me! 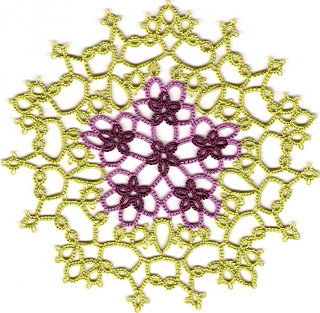 Doily center – Motif #12 from Tatting by Myra Piper. Wind two shuttles for tatting continuous thread method. First join is at picot indicated by the arrow. R 5 + 5. Do not reverse work. Ch 5 – 5. Reverse work. R 5 - 5. Do not reverse work. *R 5 – 3 – 3 – 5. Reverse work. R 5 + 5 – 5 – 5. (Join is to last picot of previous ring.) Reverse work. R 5 + 3 – 3 – 5. (Join is to last picot of previous ring.) Do not reverse work. R 5 – 5. Reverse work. Ch 5 + 5. (Join is to picot on opposite chain.) Do not reverse work. R 5 + 5 (Join to next picot on center motif.) Do not reverse work. Ch 5. Do not reverse work. R 3 – 3 + 3 – 3 – 3 – 3. (Join is to next picot on center motif.) Do not reverse work. R 5 + 5. (Join to picot on opposite ring.) Reverse work. R 3 – 3 – 3 – 3. Reverse work. Ch 5 + 5 (Join is to picot on opposite chain.) Do not reverse work. R 5 – 3 + (to 4th picot of opposite ring) 5 + (to next picot on center motif) 5 + (to next picot on center motif) 5 – 3 – 5. Do not reverse work. R 5 + 5. Reverse work. R 5 – 5. Reverse work. On last repeat, join to opposite ring. Ch 5 + 5 (Join to picot on opposite ch.) Do not reverse work. 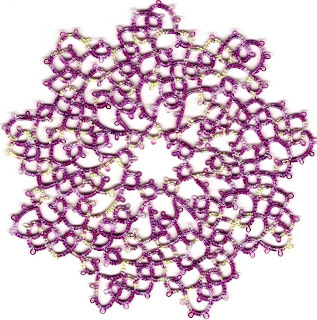 R 3 – 3 + (Join to next to last picot of large ring.) 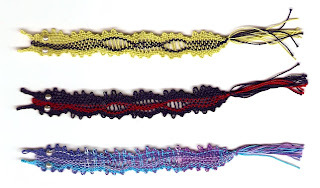 3 – 3 + (Join to next picot on center motif.) 3 – 3. Do not reverse work. Ch 5. Do not reverse work. On last repeat, join to next small ring joined to center motif. Cut and tie. Hide ends. R 5 + 5. (Join to next picot on center motif.) Do not reverse work. 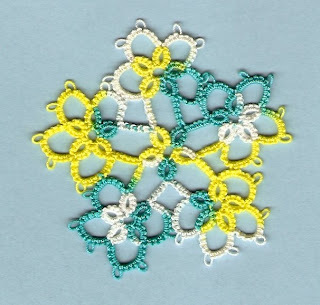 I love Myra's little 5 petal motif, and I think it would make a lovely doily center. So, I sat down and started "designing" one! I give a lot of credit to Krystle... this edging is based on her interpretation of a Julia Sanders edging. I don't think I'd ever have come up with it on my own! I have the directions written down for the first pattern repeat, and I'm ready to start the next repeat to see if I've written them correctly! As I'm working on this, I see changes I'd like to make already. I guess that means that if I like the way it looks when I'm finished, I'll be making more! I knew when I tatted this motif the last time that the color changes were not right for showing off Myra Piper's design. So, here it is in purple! The dark thread is Lizbeth No. 682, Country Grape dk. The lighter thread is Lizbeth No. 634, Violet/Pink Med. I think I need to tat this one in white and green now... it will look just like the Star Jasmine that Dave puts out in our yard every year! This makes #24 for the 25 Motif Challenge! for taking so long to proof this beautiful pattern! Honestly, I got busy and forgot all about it until this morning. It's been almost a month since Krystle asked for help proofing this pretty edging pattern. Krystle, your directions are perfectly clear, and I LOVE this edging! I made an amazing discovery this morning. My laptop is a wonderful tool for keeping track of where I am in a pattern! I wanted to get started on Krystle's pattern right away. Rather than taking time to print the pattern, I copied and pasted it into Word, zoomed in to 125%, and highlighted each row as I went along. My laptop sat on the footstool in front of me, and I was able to see the directions clearly. I just highlighted each new row as I was ready to start it. It was so much easier than looking for my pencil that always seems to disappear! Isn't this a pretty little motif? I think it would look better in a solid color, maybe even two colors. The design seems a little lost in the color change. Still, I like this one a lot! It's motif No. 12 from Tatting by Myra Piper. The thread is Altin Basak #3002, size 50. The motif measures about 2 1/2" across. I'll have to play around with this one. 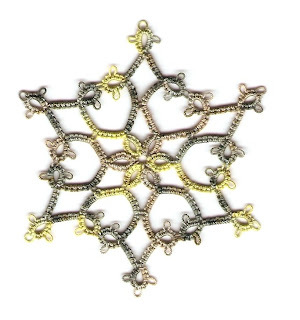 I think it would be really pretty as the center of a doily! I believe this is the first square motif I've ever tatted! This is No. 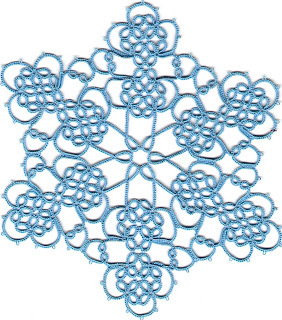 11 from Tatting by Myra Piper, Lizbeth Turquoise Lt from Handy Hands. Some day I may get ambitious and try putting several together for a doily. This motif measures about 2 1/4" across in size 20 thread. I can't believe I'm already up to #22 of the 25 Motif Challenge! Labels: Lizbeth thread, Myra Piper, Turqouise Lt. When I was visiting Eileen at the beginning of the week, I realized that we had the same t.v. service and that she was listening to satellite radio on her t.v. Music! We live in a rural area about 50 miles south of Chicago... just far enough that we don't get good radio reception in the house. I love listening to music, but I tend to forget to switch CDs when they're finished playing. Anyway, yesterday I searched and found a satellite station that plays 60s music... the stuff that was playing when I was in junior high and high school. P.S. - Please do not get the idea that I can either sing or dance! If my daughters are reading this post, they are laughing hysterically! 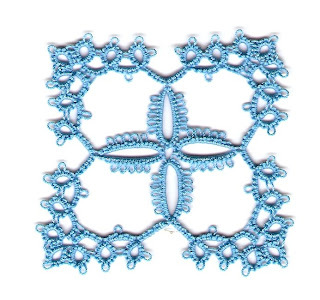 No, I haven't given up tatting for bobbin lace. The two are cohabiting quite nicely, thank you! 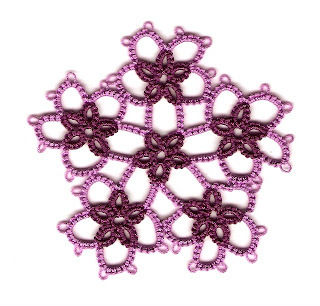 As you can see, I've been working on a larger project, Stella Alpina from Tatting Fantasia by Iris Niebach. I have a love/hate relationship with this doily... I love the pattern... I hate that I've never been able to get through it without making major mistakes! It's not Iris's fault... the directions are fine. I must get over-confident in my ability to follow patterns, and I make terrible mistakes that cannot be ignored! This time I had to cut out... yes, I said cut out... two sections because I counted rings and chains incorrectly! 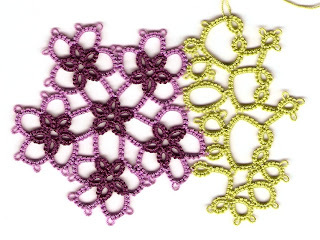 When I was visiting Eileen earlier in the week, I took along tatting samples, and their were two pieces of Stella Alpina that I gave up on last year. If you look closely, you will see that there is one place where I forgot to join. Oh, well! I love the color. I love the pattern. I love that it's finished, except for blocking. This one will find a home in the tatting shuttle display case that my dad made for me. It's 8 1/2" from point to point, and I used Lizbeth Turqouise Lt. #662, size 20 from Handy Hands. I think I'll go back to Myra Piper's book now and give my brain a rest! As for bobbin lace... I have another bookworm ready to go! I'm going to keep making those little creatures until I'm happy with the end result. That should give me enough for Christmas presents for family members. Do you think they'll be happy with receiving just a bookworm? Probably not, so I'll have to come up with some more ideas... there's nothing like planning ahead! Labels: Iris Niebach, Lizbeth thread, Stella alpina, Turqouise Lt. When I talked with my mom this morning, she requested a green bookworm. How could I refuse? I'll get it in the mail on Monday, Mom! After finishing my second bookworm, I decided I needed to finish up this tatted motif from Tatting by Myra Piper. In case you hadn't guessed, I really like this little book! This one is No. 5, done in size 20 Weathered Stone from Yarnplayer. It measures about 3" across. I had fun making another bookworm this morning. I think he looks very patriotic in red and blue perle cotton and those gorgeous pearl eyes! I was able to follow the pattern much more easily this time. I think I might make several of these for Christmas presents for next year. I might as well get an early start! I finished my first bobbin lace project! I am so stoked! I totally messed up reading the pattern, but I don't care! I learned a lot. I figured out what my "mistakes" were, and to top it all off... I finished it! This little guy looks great to me! Wait... I didn't make any mistakes... I designed my own bookworm! Whoo hoo! I finally have a day to do something I enjoy! This morning I wound this lovely peach thread that Snowy sent to me and made a bookmark for myself. It's Anchor #6, and it was wonderful to work with! The pattern is No. 4 from Myra Piper's Tatting. The one chain is too small. I think I must have tatted it more tightly than the others. I didn't notice the difference in chain length until I laid the bookmark out for scanning. Oh, well. It's pretty, and I will love using this bookmark! I'm headed off for a mid-morning snack, and then I get to work on my bobbin lace! Yesterday, I went to visit my college roommate, Eileen. We first became friends our senior year in high school. We shared a love of... tater tots! We were roommates for two years, then we both dropped out of college. I went back after a year. Eileen met Tom and married him. I was her maid of honor; she was my matron of honor (the first time around). Do you have a friend who knows so much about you that you can pick up a conversation years later without missing a beat? That's the kind of friend Eileen is. We are so comfortable around each other that I don't think we've ever been awkward around each other. Anyway, I didn't get home until after dark, so I didn't pick up the mail until this morning. I received my exchange package from Snowy! I love getting gifts, and this one is extra special because Snowy included one of her lovely pieces of tatting! I can't wait to try the samples of thread she sent... Valdani, Gutermann, and Anchor! I've never tatted with any of them, so this will be an adventure for me! The chocolates have cherries with liquor (sp?) in them... they're wonderful! I'm not a huge chocolate fan, but I do have a weakness for chocolate covered cherries! Snowy also sent me some blue paper for my bobbin lace. I haven't found any around here, so I am very grateful to have some that I can work with. Thank you, Snowy! This was my take-along project for our trip to Minnesota this past weekend. I would have finished it yesterday, but I drove for a while on the way up and on the way back so that Dave could work on some things for work. I can't remember what this color is, and I lost the tag a long time ago when I was making some bookmarks with it. It's from Sherry Pence aka LadyShuttleMaker. Every time I start tatting with this thread I think of my favorite cereal, Grape Nuts! The pattern? Mary Konior's Spinning Wheel Glass Mat, of course! I thought I was done with this pattern for a while, but Bonnie, Jeff, and Pamela all posted pictures, and I just had to make another! I was going to make it in Pamela's Blue Lagoon, but this thread was already on my yarn daisy, so I decided to use. I'm glad I did! I thought for sure that Lily would love this one, because her favorite color is purple. She said that her mommy might like it. She wants one in rainbow colors with roses! Lesson learned... never ask a 4 year old what she wants unless you're prepared to follow through. I guess I have my work cut out for me! I can't believe how busy the past week has been! We drove to Minnesota this weekend to visit two of our daughters and their families, and stopped to visit another daughter and her family on the way home. Our daughter Carol is on a whirlwind tour of London, Paris, Florence, and Rome... in ten days! Friday was spent helping her with last minute purchases for the trip and getting her to the pick-up point on time. I really have the itch to work on my bobbin lace and tatting, but I'm not sure how long it will be before I can get to it. I have my annual check-up today at the doctor. I need to get the oil changed on the car. I really need to get some housework done, and Dave asked me to put together some price sheets for the greenhouse today. Tomorrow I'm off to visit my college roommate. Wednesday I'm getting my hair cut, then meeting friends to celebrate a birthday, not mine! I finally found my misplaced book Little Dorrit for my online book club. It was in a very strange place... a bookcase! I must have had a glimmer of organizational prowess a couple of weeks ago! I'm getting the hang of it! My bobbin lace pillow arrived yesterday, along with spangled bobbins, a pattern book, thread, pins, and a pin cushion. Thank you for the recommendation, Tatman! First, I made my pricking... what a feeling of accomplishment! Next, I wound the bobbins, which took me a really long time, because I kept dropping the bobbins! I felt like such a fumble fingers! Then, I read and re-read the directions for the worm bookmark before getting started. Try as I might, I could not make sense of them! Then early this morning, I remembered that the instructor last week had numbered the bobbins and taught us the moves using the bobbin numbers. I made myself a little cheat sheet this afternoon, and the motions finally made sense to me! I was so proud of myself when I successfully added the beads for the eyes. I know I'm taking baby steps, but I'm confident that I'll be able to make beautiful bobbin lace soon! Here's what I'm working on... Stella Alpina by Iris Niebach. I told you I'd be giving my brain a break! The thread is Lizbeth Turquoise Lt. #662. The chocolate is in my desk drawer at school... yes, I'll be munching between classes! 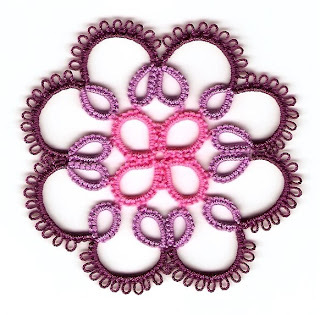 I hope everyone has a wonderful Tatting Day!